Posted by Dave Ternier - March 25, 2014 - Always Learning! I spent this past weekend with friends Bryan Podworny of Expressions Entertainment, Cory Gulenchin of Hot Shot Entertainment, Katrina Sigurdson of Party Professionals and a host of enthusiastic ladies (and one additional gent!) at the Hotel Fort Garry in Winnipeg for some really exciting stuff! 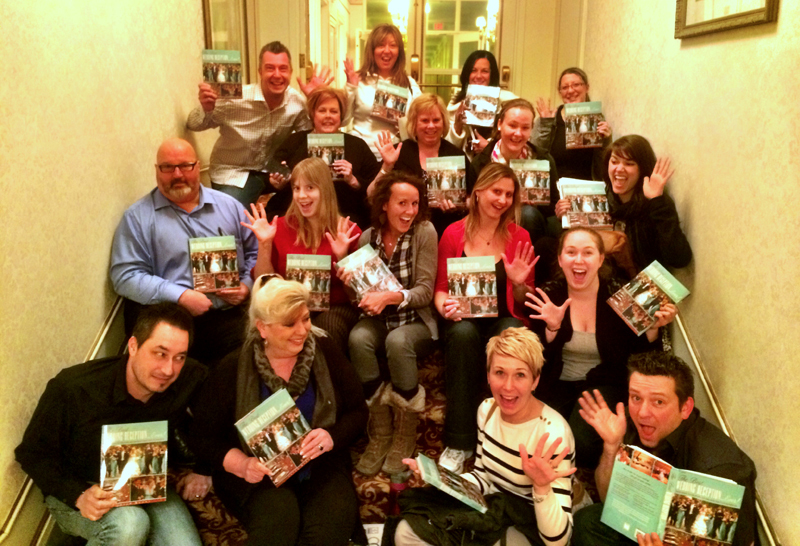 We were all there with the intent of starting down the road to becoming certified Wedding Coordinators through the Wedding Planners Institute of Canada (WPIC). Having heard much about what WPIC works on, this was a long awaited joy to participate in. We were extremely lucky to have Wedding Coordinator, Monica Caeser of Aisle Plan Your Day, leading us through the instruction this weekend. Having witnessed many presenters and workshop leaders over the last number of years, Monica’s poise, energy and warmth stand high and above many others. I think it’s safe to say that within moments, everyone in the class had fallen in love with this bubbly, enthusiast and easy going individual. She facilitated a weekend that honestly flew by (even with the days running from 8:00 AM – 7:00 PM). For myself specifically, the weekend was a great opportunity to meet new people and provided an eye opening account of what goes into the job that most people typically refer to as a “Wedding Planner”. The organization and detailed assistance that Professional Wedding Coordinator’s offer is truly, in my opinion, a highly valuable service. As the average couple spends about 250 hours planning a wedding, I’m sure the idea that a professional might be available to dramatically decrease that number would be welcome news to many planning a wedding. The role I play as a Wedding Entertainment Director® with my wedding couples would be greatly enhanced, were a WPIC certified graduate also brought on board to work with them. It is with great enthusiasm that, while I don’t know if I’ll get into playing the role of a Wedding Coordinator specifically, I look forward to my first opportunity to work with one. I met many talented people in this past weekends workshop and am sure that some of them will go on to do great things in the Wedding industry. This write up would be incomplete without my mentioning two additional details about the weekend though. The first is the treat we were given part way through day one when Amanda Douglas of Amanda Douglas Events stopped in to share with us, her experience with WPIC and her work, now as a self employed full time Wedding Coordinator in Winnipeg. Her story of putting together the building blocks that brought her to the position of finally pursuing her dream full time was very inspiring. She spoke well, was funny and had such an open personality that it encouraged many to ask numerous questions which she had no problem at all in answering. The wedding couples employing Amanda’s skills and talents are truly lucky individuals. I look forward to bringing the role of a Wedding Entertainment Director® alongside her very soon. I believe that together we might be able to make some pretty incredible things happen! The last bit I want to share in today’s entry to my story board here… is that the name of WED Guild® founder, Peter Merry was brought up on day two. I actually missed specifically how that conversation started, but our instructor Monica had experienced Peter presenting his seminar “The Starbucks Effect” at a conference she’d attended in the Bahamas. After some brief conversation about him, the topic of Peter’s book, The Best Wedding Reception… EVER! came up. I shared that I happened to have a case of them in my truck, and after a very enthusiastic endorsement by Monica, it turned out that many of the ladies in the course wanted a copy! I told them we’d do this so long as I could get a group photo of all of us holding a copy in order to send to Peter! This image essentially sums up the fun our group had getting to know each other over the weekend. We shared in a lot of laughs, there may have been a few tears (along with an outstanding song, Etana’s “Happy Heart”, we were witness to a really, really beautiful destination wedding video) and many new friendships were formed. As much as we insisted she be in the photograph too, Monica wanted to take the photo for us, so you’ll have to head over to her website or her Facebook page to see how wonderful this woman is. From every one of us Monica, thank you very much for sharing your talents with us this past weekend. We are truly grateful. Even with the miserable cold here… you’ve managed to inspire us all! The education & networking this weekend brought about was honestly, pretty awesome! I look forward to many new relationships with those in the community of Wedding Coordinating and Planning and those specifically within the WPIC community. Cheers everyone and chat soon! What a wonderful review of the weekend! Thank you for sharing this. Monica had already shared how great and special this class was, it is nice to hear it from a student perspective as well! P.S. Peter was indeed a great addition to our WPIC Conference in The Bahamas 😉 We have a copy of his book in our office. Thank you so much for the comment Danielle! A weekend such as it was deserves a review like this. What a fantastic write up about the class! It was my absolute pleasure being a part of the WPIC team to instruct and certify this group in Winnipeg! It was a fantastic weekend and I know the potential for success in that room was over flowing! Wishing you the utmost success and thank you for your very kind words! Caesar as our class instructor, she was fabulous! I was intrigued & fascinated to hear about your entertaining business and what you do. As a new Wedding Planner, this is an area of the planning business that I would like to explore. What you provide to wedding couples in my opinion plays such an integral & important part of their wedding experience and their entire reception. Its all about creating happy & wonderful memories for the wedding couple & their guests for years to come. It certainly opened my eyes to another facet of the wedding planning business that can only enhance their big day! I look forward to learning more & keeping in touch! Good luck on your exam & have a great wedding season. Cheers, Linda. Thank you Linda, the pleasure was also ours. It was fun working on things with you too… particularly our 100 person wedding with 42 kids!!! 🙂 We will absolutely keep in touch, coffee is on me!